Bring doughnuts to the office your coworkers will remember! Receive 25% off 2 dozen or more of our most popular assorted doughnuts + free delivery! Submit this form by 5 pm the day before delivery. You will receive a confirmation email by 8 pm the day you place your order. Please let us know if you would to pick up your doughnuts from the shop or have them delivered. If you are picking up, contact us if you will be late or need to change your pick up time. Otherwise we cannot guarantee your order will be ready when you arrive. We will notify you if the delivery time you have selected is unavailable. 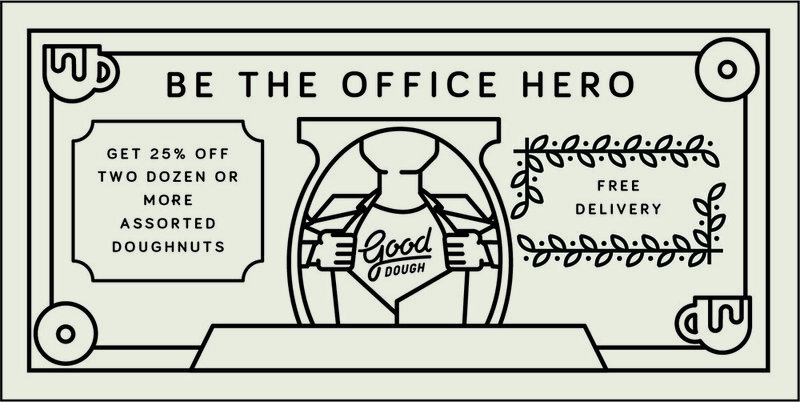 Free delivery is available within a 15 mile radius of Good Dough. Please include any additional details for delivery and/or setup as needed--for example, parking instructions, floor number, etc. An assortment of our most popular flavors, including monthly specials, are included. No substitutions please. If you have submitted your order by 5 pm we will be in touch the same day, if submitted after 5 pm we will respond the following day.